27 September 2007 marks the 50th anniversary of the birth of the Capelinhos Volcano at the western end of Faial, one of the islands in the Azores. There were huge limitations on the study of underwater volcanic activity until it became possible to study the planet in a wide variety of ways from more or less sophisticated satellites after the 1980s. For reasons known only to Mother Nature, the Capelinhos Volcano broke through the island’s crust along the same fault as genetically similar predecessors (such as the Costado da Nau Volcano) at the westernmost end of Faial. After so many years, Capelinhos can still be considered unique in the world of volcanological science, as it was photographed, observed, studied and interpreted right from the beginning (around 7 a.m. on 27 September 1957) until it “fell asleep” on a quiet afternoon of 24 October 1958. All this attention was the result of the proximity to Faial of an inimitable local engineer called Frederico Machado (Director of the District Public Works Department) and the team that he set up while the volcanic activity and the erosion period lasted. His work was, of course, authorised by the Civil Governor, Freitas Pimentel, a physician by profession. He was sensitive to nature’s manifestations and concerned for the safety of the local inhabitants for whom he was responsible. All the departments of the General Council of the Horta District and the central government, represented by the Minister of Public Works, Arantes e Oliveira, sent substantial financial resources to the island. In reaction to the economic and social catastrophe, the Azorean community living in the United States used its influence to open an extraordinary quota of emigrants (the so-called “volcano victims”) which reduced the island’s population by around one half in little over a year. 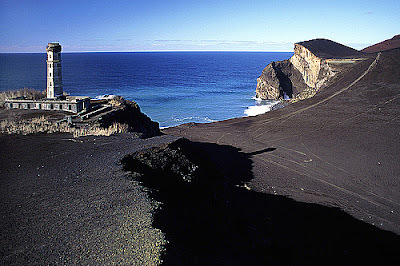 After almost 50 years, the new land in Capelinhos, attacked by winters of differing rhythms and intensities, is much smaller (less than 50%) but it will still be one of Faial’s landmarks for another few years yet (for visitors and scientists finding explanations of active-phase phenomena in the interior of volcanoes being destroyed by erosion). Like all the other islands in the Azores, Faial is of volcanic origin and developed in four stages at different times. The oldest stage must have begun around 800,000 years ago and was responsible for the horsts in Ribeirinha, Pedro Miguel and Ponta da Espalamaca. The most recent stage, the growth of the island, involves a line of volcanic cones in the Capelo area, with its western end marked by the Capelinhos Volcano. The Capelinhos Volcano is proof that many of the islands in the Azores are divided into volcanically active sectors. In practical terms, this means that volcanic episodes are going to occur in different parts of the islands over the centuries. The Capelinhos Volcano is one of the best examples in the world of vulcanology, not only because people continue to observe it but also because of the originality of its development. In other words, Capelinhos was a sequential example of the birth and development of the Azores. It began as an underwater volcano and ended up as a land volcano. Capelinhos did not appear from one moment to the next. It was preceded by periods of seismic activity that began in early May 1957 and reached their peak on 16 and 27 September 1957. On the morning of the 27th, the earth was shaking and the whale spotters at Costado da Nau, a few metres above the Capelinhos Lighthouse, saw the ocean churning to the west, half a mile from the shore. Alarmed, they ran down to the lighthouse and warned the lighthouse keepers and their fellow whalers at Comprido harbour. This was no whale or other creature, the sea was boiling and there was a foul smell! The authorities were called and launches and whaleboats set off for Castelo Branco. Families bundled up their belongings and went down to the whaleboats. At 7 a.m. the ocean was billowing smoke, and the first ash appeared at 8, like bursts of Japanese cedar. That’s how the underwater phase of the Capelinhos Volcano began. Another three vents appeared a few hours later to make four in all. By the end of the day, there was a column of steam more than four kilometres high visible from all the central islands. In early October, there was so much ash (sand and dust with occasional blocks of basalt) that it created a horseshoe-shaped islet opening to the southwest. It was given the name of Ilha Nova (New Island). When the wind veered to the west the ash fell on Faial and destroyed all the vegetation. As time went by, it began to cover houses, gardens, pastures and roads. In November the new islet joined the old Capelinhos islets (left over from a similar eruption in the past) and formed an isthmus to Faial, making it bigger. On 16 December 1957, to everyone’s amazement, instead of ash the Capelinhos Volcano began to spout bright showers of molten basalt – a breathtaking spectacle! In late December the ash returned and once or twice there were signs of lava, especially along the lines of craters. The earth shook all the time. It was a volcanic tremor, a phenomenon explained by the scientists who came from the four corners of the earth. Among them was Tazieff, the famous Belgian vulcanologist, who made friends with the Faial people and with whom I spent time for many years. In the first three months of 1958 there were mostly episodes of underwater activity, with pointed, cypressoid jets, some of them impressively large and high. When the wind blew from the west, life on Faial was unbearable. The ash reached Horta and the smell of sulphur pervaded everything. The volcanic centres moved more to the east, coming closer to the “old island”. The lighthouse was bombarded with ash and basalt blocks and it was only by chance that none of the many onlookers were hit as they stood on their viewpoint more than a kilometre away. In the first four months of 1958, there were several variations in underwater activity at Capelinhos. The isthmus grew and Ilha Nova was now part of Faial, the “old island”. Long beaches were formed and filled the bays of Varadouro and Praia do Norte. In May 1958, the landscape of the Capelinhos Volcano changed drastically. The underwater phase gave way to strombolian eruptions and incandescent lapilli. On the night of the 12th, a lake of lava with high jets of molten basalt appeared. Meanwhile, the centre of the Caldeira Volcano erupted and belched very fine, greyish ash. Fortunately this volcanic phase was limited to Capelinhos and the caldera did not follow suit. On the night of the 12th, Faial was shaken by a violent earthquake and some geological faults moved. Some faults in the outer caldera area rose 1.5 metres and two-metre-wide clefts opened up in parts of Praia do Norte. All the houses in Praia do Norte collapsed and many homes in Norte Pequeno and Capelo were severely damaged. No-one was killed because that evening Frederico Machado advised Governor Freitas Pimentel to evacuate people from their homes. It was a remarkable but risky decision! I remember the warnings very clearly. From May onwards, the Capelinhos Volcano moved into its land phase, emitting incandescent lapilli and long rivers of pahoehoe and a’a lava. This phase, which substantially increased the area of “new land” and built a cone of lapilli that can still be seen today, lasted until October 1958. It emitted 24 million cubic metres of molten basalt. The last strombolian eruptions of reddish lapilli occurred without warning on 24 October 1958. The degasification, cooling and erosion process began on the 25th and has lasted to the present day.